When the world’s greatest detective is violently murdered by her nemesis, her corporate backed super team and former sidekick band together to bring the villain to justice. However, the mission goes terribly wrong, and before the night is out each of the ten “heroes” will pay dearly for past transgressions. THE RED TEN is a ten-issue maxi-series by writer Tyler James and artist Cesar Feliciano, with stunning covers by CP Wilson, III. Get THE RED TEN from your local comic shop! Find a comic shop near you! The dark and gritty realism of the brutal opener pulled me in instantly…The Red Ten could be a fun romp of a super hero mystery. 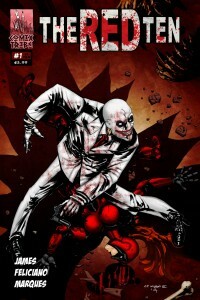 THE RED TEN is the kinda comic that doesn’t come around very often. A truly excellent indie title that needs to be shoved into every comic loving fans grubby fingers. It’s good. Really good. RETAILERS: Full PDF Previews of THE RED TEN Available on Request! Contact tyler.james@comixtribe.com for full previews and information on ordering incentives. Want to know more about THE RED TEN?